Cartoon illustration of our 4 selected target areas (circles) shown in a Galactic projection of the 2MASS sky. The banner at the top of the page illustrates one WTS field made up of two tiles (one red and one blue). Each tile is made from 4 WFCAM pawprints (shown in yellow). RMS diagram for one WTS pawprint (the 19h+36 field) comprising 2 seasons of data and 470 individual epochs. We bottom out at 3-5 millimag at the bright end (J=13). Work is currently underway to investigate the systematic noise properties of the data, and to see if we can improve our processing. 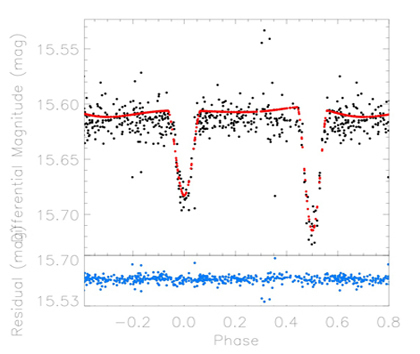 An example positive detection from our automated search for eclipses. In the top panel the vertical red lines show the gaps between nights (which are not necessarily consecutive). The bottom panel shows the phase folded lightcurve on the best fit period from occfit. More detailed analysis shows this is most likely a blended EB showing distinct primary and secondary eclipses. 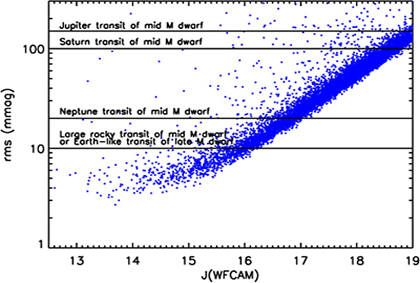 The WFCAM Transit Survey (PIs Hodgkin & Pinfield) has been awarded 200 nights of UKIRT time to perform the first ever systematic near-infrared search for transiting exo-planets around cool dwarfs. Observations started in the summer of 2007, and sufficient data now exists to begin preliminary searches for transits and eclipses for those fields with the best coverage. Planet discoveries from the WFCAM Transit Survey (WTS) could be small and rocky, and may be warm and potentially habitable worlds, and would be ideal targets for the new breed of highly stable infrared spectrographs (including PRVS and NAHUAL). are 58 transiting extrasolar planets). Cool stars are up to 10 times smaller than solar-type stars, and significantly fainter. The theory of planet formation, via core accretion, predicts that gas giants should be extremely rare around M dwarfs, while rocky planets would form just as frequently as around higher mass stars (Laughlin et al. 2004, Ida & Lin 2005). However, a handful of results seem to be at odds with this (e.g. Delfosse et al. 1998, Rivera et al. 2005) and suggest that at least some M dwarfs have Jupiter mass planets. 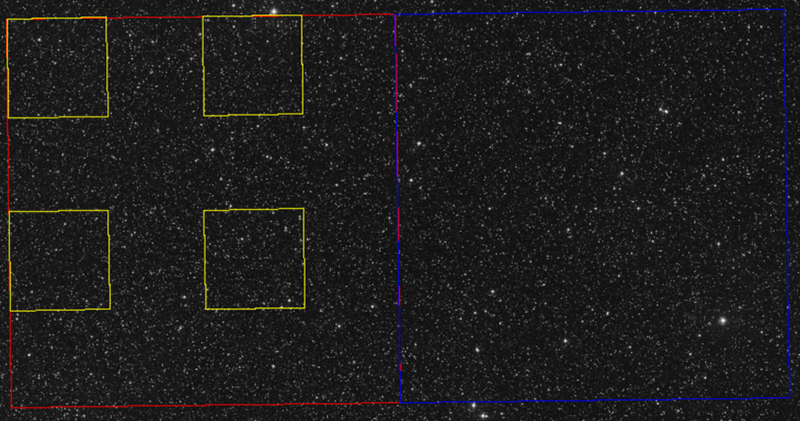 The available sample for precision spectroscopic observation is rather small (e.g. Bonfils et al. 2005). The transit method is potentially more efficient and, thanks to the smaller stellar radii, capable of detecting smaller planets around such stars. A transiting earth-like planet for example, would cause a detectable 1% transit of a 0.1Msun star. However, cool stars are much fainter at optical wavelengths, and existing optical transit surveys lack the sensitivity to find such planets. In the infrared, where cool stars are brightest, the search for transiting cool star planets becomes viable. CASU (Cambridge Astronomical Processing Unit) process the raw WFCAM frames as the data are ftp'd to Cambridge from UKIRT on a daily basis. Jayne Birkby and Simon Hodgkin at the IoA are responsible for the further processing steps required to turn the WTS calibrated images into source lightcurves. Members of the WTS can follow this link for access to the first release (release 0.1) of the WTS.